Shrubs with blue flowers or lavender flowers are among the most treasured bushes in the landscape. Blue and lavender (and similar shades associated with purple, such as lilac) are considered "cool" colors in color theory. As cool colors, they are thought to have a relaxing effect on the viewer. Bushes that bloom in such colors are highly sought after by people creating meditation gardens, but even casual gardeners can appreciate these plants. For many gardeners, blue and lavender are favorite colors, and they simply wish to enjoy flowers in those shades. The rarest of floral colors is blue, but there are few shrubs with flowers that can be called true-blue. A few cultivars of butterfly bush (Buddleia davidii) have true blue flowers, such as 'Adonis Blue.' Others have misleading names, so do not buy sight-unseen. For example, both Blue Heaven and Blue Chip are more of a lavender color than a true blue. But for some gardeners, Blue Chip has something going for it that is more important than color: It is non-invasive (unlike the species plant). Buddleia davidii 'Adonis Blue' grows best in USDA hardiness zones 5 to 9. If not planted in full sun, it can get weedy and sparse. Be careful with butterfly bush, as it can spread aggressively. Some experts recommend cutting the plant down to ground level each year to keep it under control. This cultivar typically grows to 6 to 12 feet, but heights of 15 feet are possible. It has a good long flowering period, from June into early fall. Hibiscus syriacus grows to 8 to 12 feet in height, and is hardy in USDA zones 5 to 8. It blooms from summer well into fall in most regions. California lilac (Ceanothus Concha) is not very cold-hardy, being suited only to zones 7 to 10. It is a broadleaf evergreen that will reach a mature height of 4 to 8 feet, with a spread of 6 to 12 feet. It can bear either purple or blue flowers; the flowers are quite fragrant. This June-bloomer likes full sun and a well-drained soil. Deer-resistant and drought-tolerant, California lilac will draw hummingbirds and butterflies to the yard. This plant sends down deep roots, which give it good resistance to drought. Where temperature dip to 0 degrees Fahrenheit or lower, it will die back to the ground, although it often returns. It is apt that the common name for Caryopteris x Clandonensis is "bluebeard" or "blue mist shrub." This bush's blue flowers come at a convenient time for gardeners: late summer, after the flowering season of many shrubs is long gone. Such plants are invaluable to gardeners interested in maintaining a steady sequence of bloom in the landscape. Bluebeard is a hybrid, a cross between Caryopteris and Clandonensis. The roots are hardy to zone 5, but the top growth will die back in climates colder than zone 7. A number of named cultivars are available, such as 'Blue Mist,' 'Arthur Simmonds,' 'Dark Knight,' and 'Heavenly Blue.' These are nicely compact shrubs, most remaining under 3 feet in height. They normally bloom from July to September. 'Bloom-A-Thon Lavender,' a 3 to 4 foot plant with lavender flowers that may rebloom in fall; hardy in zones 6 to 9. True blue flowers are rare with azeleas. Make sure to check local sources, as many cold-hardy varieties have been developed by regional arboretums. You can now find azaleas that survive nicely up to zone 3. 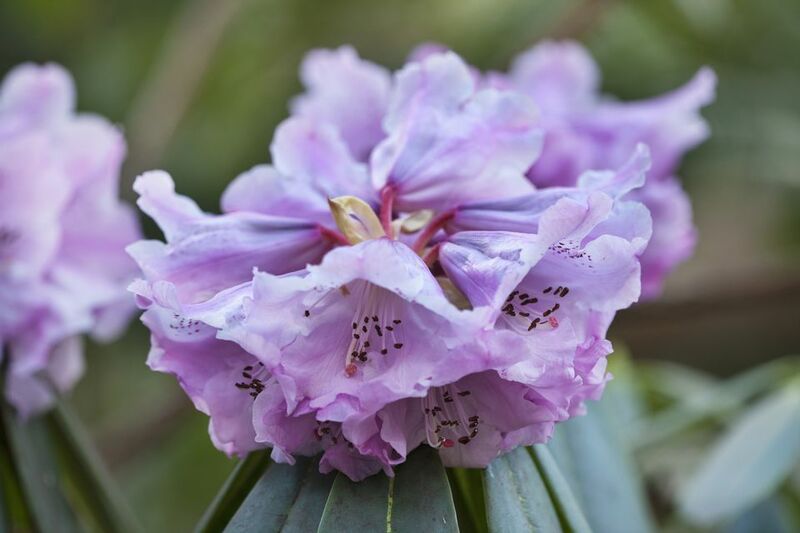 Part of the same genus as azeleas, rhododendrons differ in that they tend to be larger shrubs with larger leaves. The leaves tend to be somewhat more leathery in texture, and they may be evergreen in the right climate. And flower colors can be a more true blue shade than with azeleas. Russian sage (Perovskia atriplicifolia) gives you an airy look in a flower border because its numerous, lavender-colored flowers are tiny and its small leaves have a silvery color. This airy quality makes it a good filler plant. Grow it between plants that bear larger, showier flowers. It blooms throughout summer. Hardy in zones 4 to 9, Russian sage is a 3 to 5 foot tall plant, though it often sprawls. Flowers appear in mid-summer through fall. No list of choice for shrubs with lavender flowers would be complete without mentioning the namesake sub-shrub, lavender (Lavandula spp.). Besides its beauty and usefulness (in medicine, in the kitchen, and in potpourri), this early-summer bloomer is deer-resistant and drought-tolerant. It is best-known for its fragrant leaves and blossoms. Common lilac bush (Syringa vulgaris)​ comes in a number of colors, including lavender-blue, white, burgundy, and deep purple. A top landscape shrub for generations, it is most valued for the sweet smell of its flowers. One of its few drawbacks is that its leaves tend to get powdery mildew on them by late summer. The mildew does not harm the plant, so if you can simply ignore it, you will be very happy growing this late-spring bloomer. Common lilac comes in a variety of cultivars with different shades of blues, lavenders, purples, and whites. This is generally a rather large shrub, growing as tall as 20 feet, although some cultivars top out at 12 feet or so. There are also other lilac species that are more compact, such as 'Miss Kim' (Syringa pubescens subsp. patula 'Miss Kim'), which remains under 9 feet; and dwarf Korean lilacs, such Syringa meyeri 'Palibin,' which remains under 5 feet in height. There are lilac varieties suitable for most climate regions, from zones 3 to 8. Heath and heather, although different plants, share many characteristics beyond have similar names. Heath belongs to the Erica genus, heather to the Calluna genus, but they are both part of the Ericaceae family of plants and have a similar appearance and cultural needs in the landscape. Both tend to be short shrubs,1 to 2 foot tall, with a spread of 2 to 3 feet. There are heather and heath species that can be planted from zones 4 to 7. They are evergreen shrubs, and the bloom period can range from spring to late summer and fall, depending on species and variety. Winter heath (Erica x darleyensis) is popular in North America, as gardeners have come to realize just how long a blooming period it has. It can also bloom in winter, making it a rarity. It is hardy in zones 5 to 7, and rarely gets over 1 foot tall. Within its hardiness range, it can bloom from January through March.